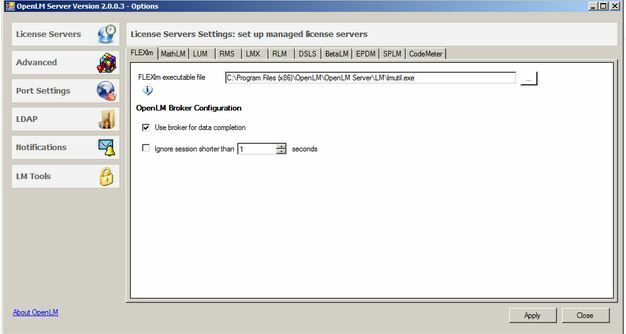 OpenLM is a Software license management and monitoring tool. It is devised to provide a clear image of license inventory, as well as to extract insight on software application usage patterns and statistics. OpenLM optimizes software license availability, minimizes license denials, cuts application idle time and boosts the utilization of expensive licensed applications. OpenLM is applicable to organizations of all sizes and geographic locations. It holds benefits for all role players in the organization; Managers, Administrators and End-users alike. OpenLM interfaces a large variety of license managers (e.g. Flexera Flexnet publisher and DSLS), and is dynamically striving to increase its portfolio. See a complete list of supported license servers here. It can also be applied to monitor general software applications regardless of their license server type. The OpenLM system consists of a number of modules. An overview of these modules is found here. This document presents a screenshot appearance of the main OpenLM modules. OpenLM also provides a set of peripheral modules, bringing a spirit of innovation to Software Asset Management. For example, check out the OpenLM license Router . If you have any request or suggestion regarding license management – please let us know; Our team would love to hear your insights. The EasyAdmin web interface is the main OpenLM user interface for reporting and system configuration. It is accessible from any standard internet browser, e.g. : Mozilla FireFox, Microsoft Internet Explorer, Opera, Apple Safari & Google Chrome. OpenLM Broker status on each license server. General statistics on license on daily and weekly license usage. One-glance status of critical features over multiple license servers. The Dashboard features a Windows-like interface that facilitates access and management of Windows on a standard browser interface. The ’Training’ icon expands to a short serie of slates. The slates demonstrate some technical qualities of the EasyAdmin windows, e.g. : Version information , Configuring filters and Adding columns. We recommend going through this short tutorial once. Yellow: Problem on license server side, e.g. : Broker down, LM down, Time difference error. Red: Down. No communication with license server. Host availability indication diagram provides the full information regarding the server’s activity over time. 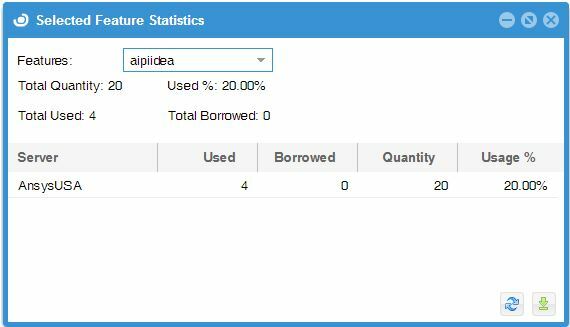 This window allows you to easily see the number of licenses used, the number of licenses borrowed, and the license-usage percentage. It’s easy to add features by using the filter. The OpenLM Alerts module is designed to ensure the stability of the licensing system. It enables system managers to define alert conditions, and consequent actions that will be taken when these conditions are met. The system can present alert messages on the EasyAdmin ‘Alerts’ window, as well as a log file. It can also be set to send alert messages to predefined email or SMS accounts. The licenses window lists available licenses, and allows easy management of the organizational assets. A sophisticated sliding filter enables users to filter long lists easily. 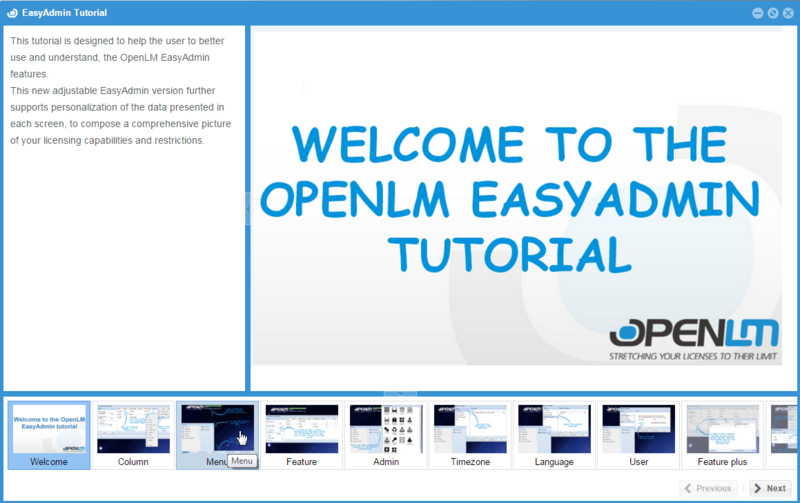 OpenLM EasyAdmin supports advanced features like Flexnet packages (As used by Autodesk that produce Autocad). License Packages appear as boxed items. This window lists all the available licenses’ information resident in the OpenLM database. License properties, e.g. : Quantity, Start, Issue and Expiration dates. Licenses that are approaching their expiration date are marked red. Single out licenses that have not been used for a predefined period of time. This bar chart represents a histogram of license usage, i.e. each column ‘x’ answers the question: “what is the percentage of usage time that x licenses have been in use”. This form of presentation ignores momentary usage peaks, and provides a vivid realization of the true license consumption pattern. It clearly depicts the number of licenses that are actually required in the organization. License managers may sometimes label licenses as occupied, when in fact they are idle and wasting your limited resources. 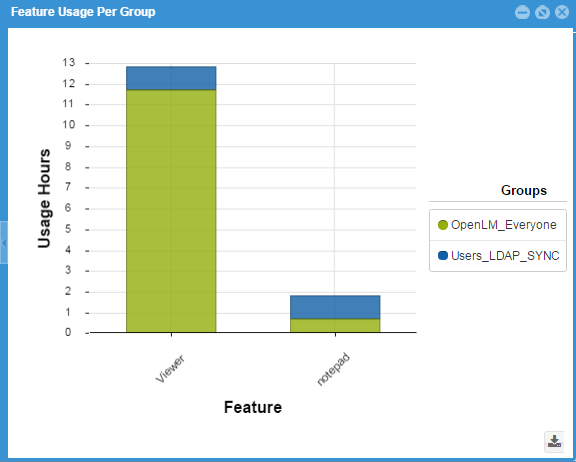 OpenLM EasyAdmin identifies these conditions, and resolves the problem of idle licenses. The Active Products window lists all active users. It also serves as an interface for authorized system managers to retrieve a license from any user when necessary. The Released Licenses window reports license release (check-ins). This functionality is only relevant for applications with supported extensions such as ESRI Desktop ArcGIS and Autodesk. 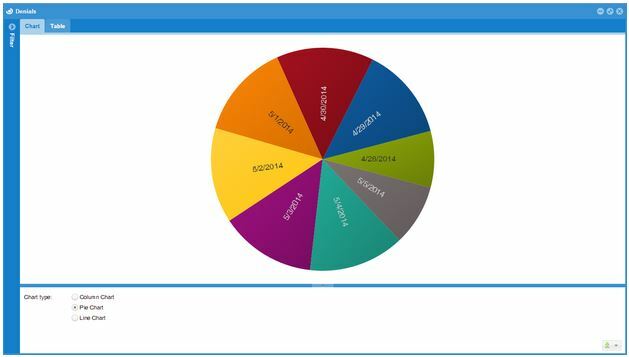 The License Activity window is a very powerful tool that enables system administrators and managers to produce sophisticated reports, and track license activity of individual users. 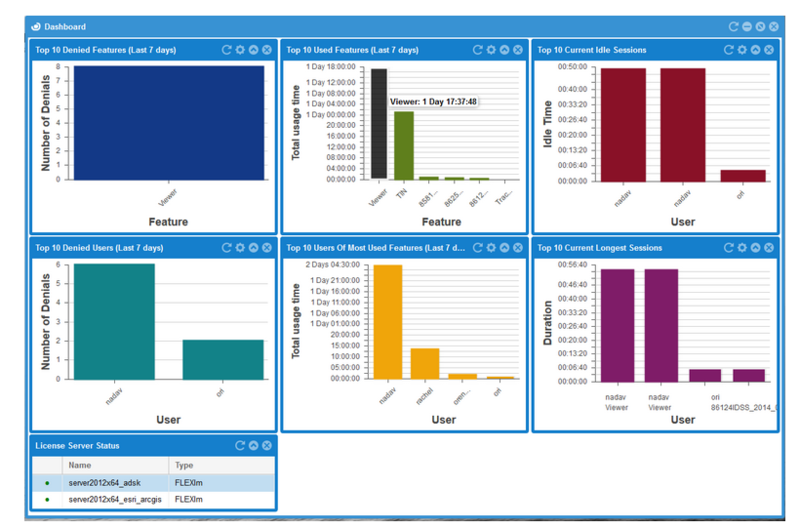 The “Group by” tab on this window facilitates license statistics report generation according to Workstations, Features, Users, Groups, and Projects. Information may be sliced according to a list of criteria, e.g. : time, user, project, group, workstation, denial type, vendor name, license server, license type (e.g. Floating, Node-locked), and “additional key” (e.g. FlexLM asset info). It may be presented as a pie chart, line or table. License requests that have been denied by one server, but granted by another. 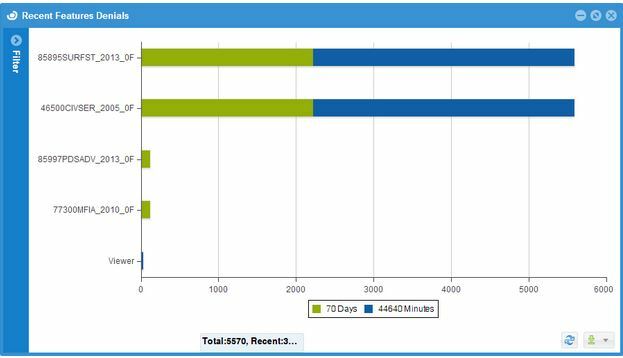 This window presents the usage in hours of selected features per the selected user groups or all active groups, in a stacked vertical bar chart. 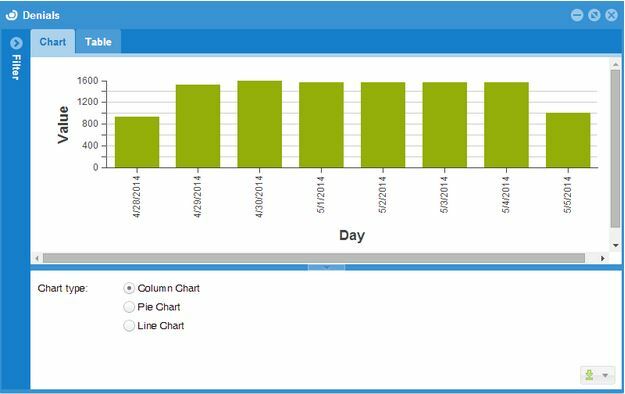 Hover over the chart to view explicit usage information per each section of the bars. 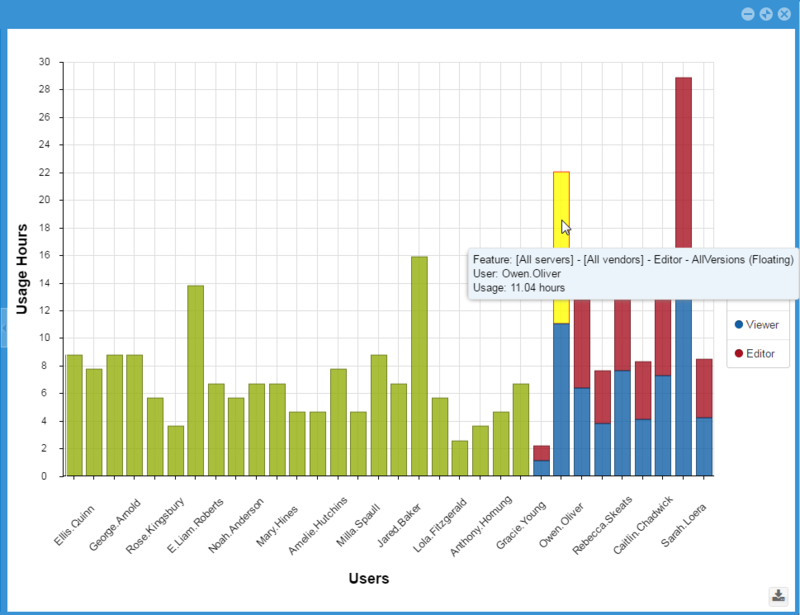 This window presents the usage in hours of selected features per the selected users or per all active users, in a stacked vertical bar chart. 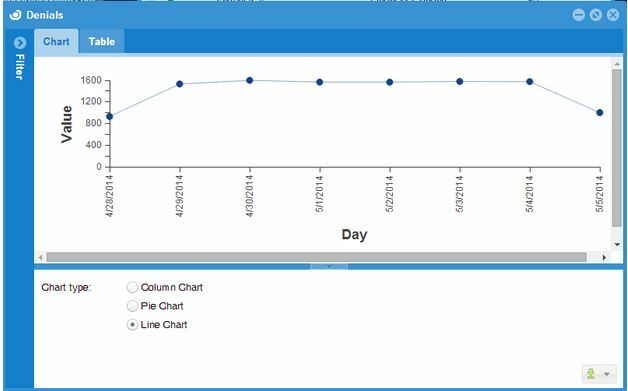 Hover over the chart to view explicit usage information per each section of the bars. 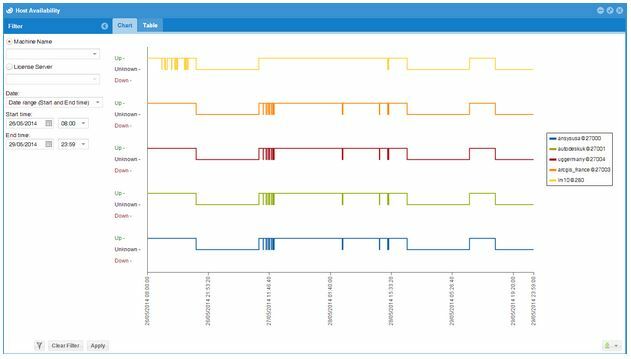 This window provides preliminary statistic processing of license denials per feature: It presents the number of denied license requests in long term and short term period. 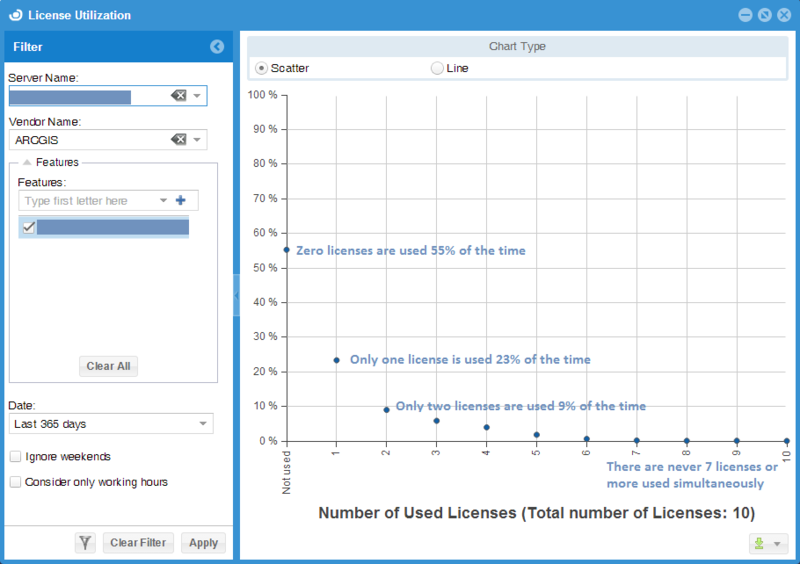 The license usage reports allows system administrators to compare the actual license usage to the number of available licenses. The smart Filter enables users to build a customized list of licenses and get the total usage on those licenses. 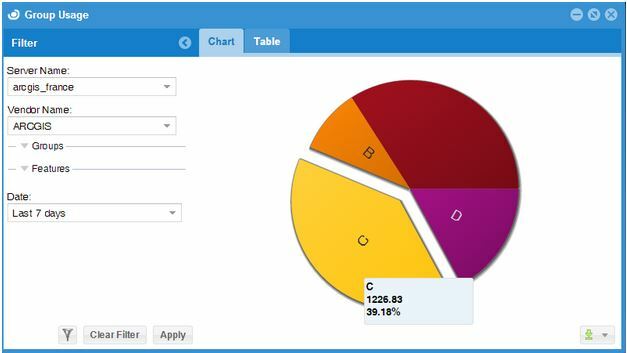 This report is available in 3 different formats, according to the tabs in the display pane: As a table, a chart or as a heatmap diagram, as depicted below. When displaying a chart view, the displayed period can also be zoomed – in using the zoom drag buttons, at the bottom of the chart. 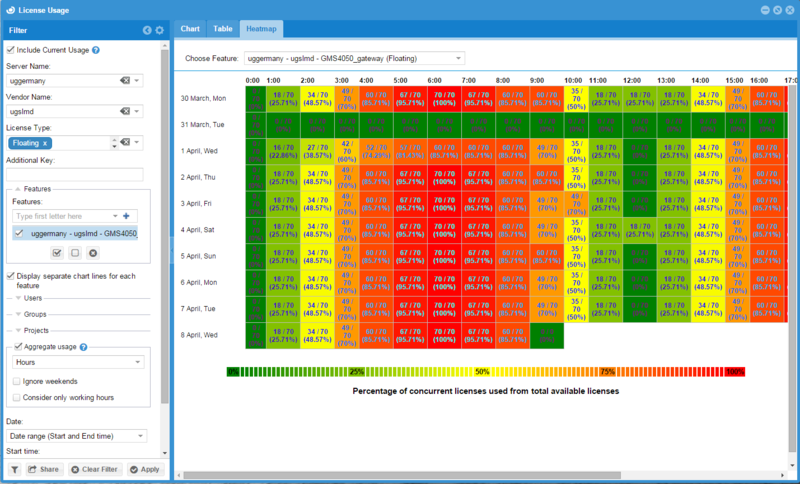 The “Aggregated usage” check box selects between displaying the maximal level of usage sampled per period (hour /day / week) or the actual usage occurrences as reported by the license manager. 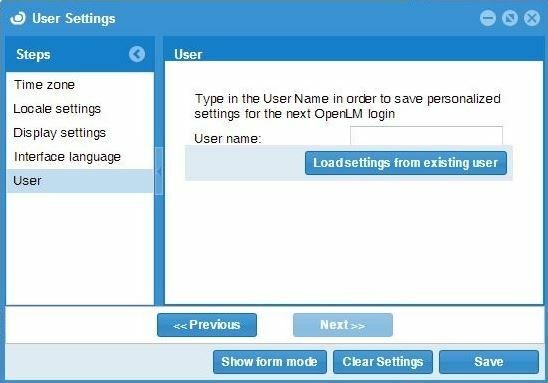 OpenLM enables organization to manage users according to groups and projects, and obtain the total usage time for these groups very easily. This could be done either manually, or by synchronizing the OpenLM database with the organization’s Active directory. This functionality is often applied in order to implement license charge back policy (license usage billing). 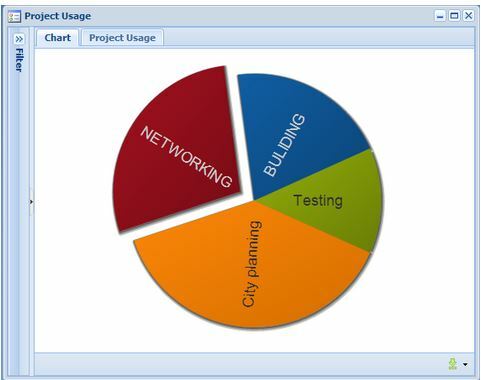 Project reporting enables project-oriented companies to get license usage time according to the active project, as reported by the end user. Group reporting allows managers and system administrators to obtain license usage statistics according to groups. The configuration screens allows users to set their preferences. The choice of working hours effects the statistical information which is calculated shown to all system users. The configured preferences in the “User settings” window effect the format of information as it is presented to the User. The Workstations window provides all the information a system administrator needs in order to manage workstations that are accessing licenses. 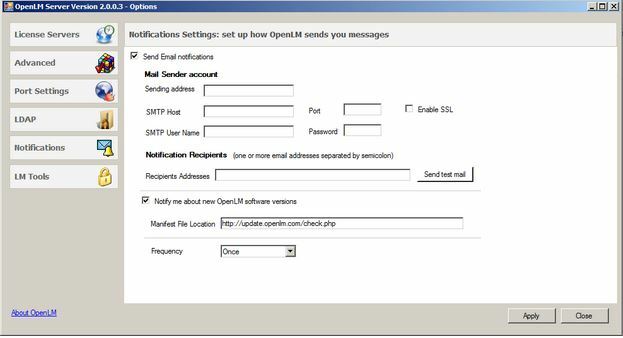 The OpenLM Server is the hub component of the OpenLM Utilizer system. It collects license usage information from various sources and stores it in a relational database. 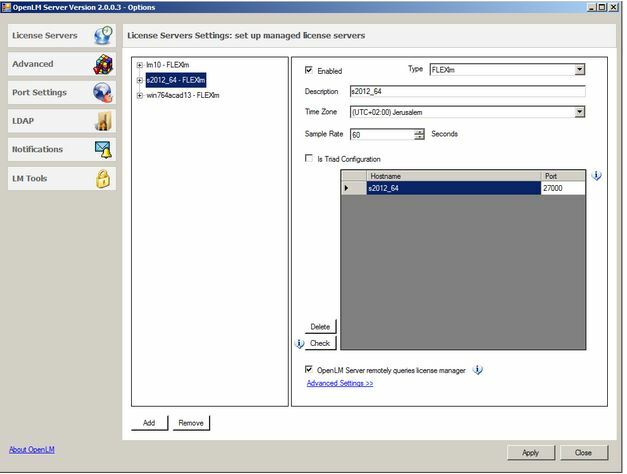 The OpenLM Server is a Windows service that can manage and monitor multiple license servers such as Flexera FlexLM (Flexnet publisher), Beta LM, IBM LUM, DSLS, Sentinel HASP, Sentinel RMS, Reprise RLM, MathLM, and LM-X, located in different time zones and running on different operating systems (UNIX, Linux, or Windows). This tab enables system administrators to effectively configure and manage license servers (e.g. FlexLM and Sentinel RMS) via the OpenLM Server. The OpenLM server supports world-wide license server monitoring; It is important to specify the timezone of each server. After introducing new license servers, it is recommended to click the “Check” button to verify that the OpenLM server is able to connect to the license server. Free text display names are attached to each server for better identification. Fail safe server (Triad configuration) may also be configured on this tab. The Openlm Server interfaces all other OpenLM peripheral modules via ports, which numbers are defined in this form. The OpenLM server can synchronize users and user groups with organizations’ LDAP Database (Microsoft Active Directory). 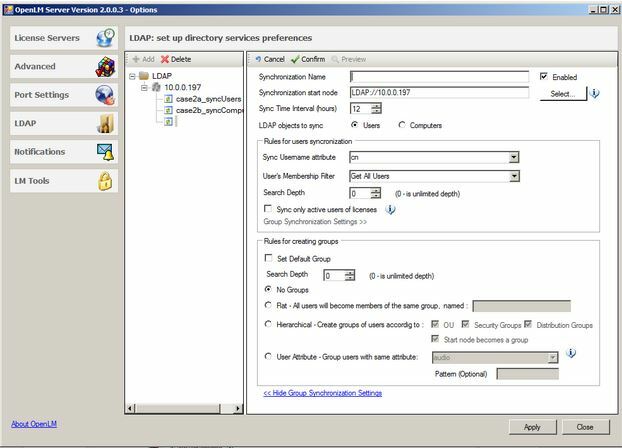 OpenLM provides multiple policies for Group synchronizations. 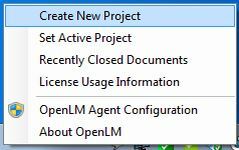 These settings allow OpenLM to send error notifications, updates on new releases, and other important messages aimed at improving the license usage. 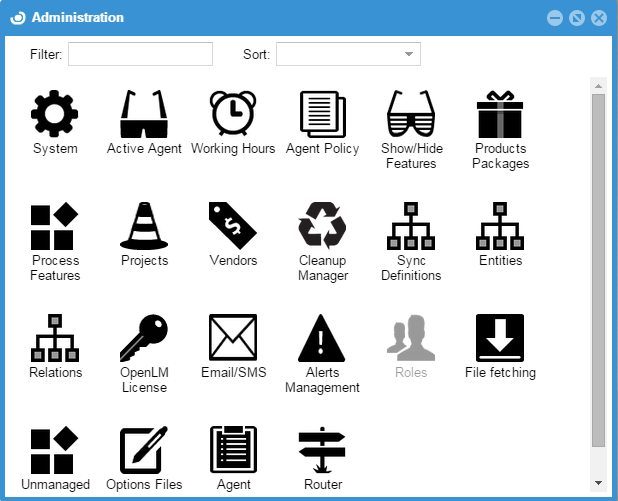 The LM tools tab holds the directories in which every license manager commands are located. user and provides advanced functionality. Close and reopen idle sessions. Provide usage information on “Unmanaged” licensed applications. Allows the user to set an active project. Allows ArcGIS users to set the ESRI license level. The blue and white icon indicates connectivity to OpenLM Server. The grey icon indicates no connectivity to OpenLM Server. The License Usage Information window is available to the end user. The ability to query license availability from the end user workstation is a very important step towards improving license usability. The license usage window displays the total number of used, borrowed, and available licenses. Click on a row to get the complete list of active users who are currently drawing on that license. 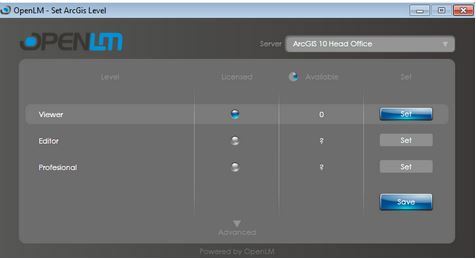 The OpenLM Agent enables users to identify who is currently running a certain floating license on which station. This is an important and useful feature for any system that incorporates floating licenses such as: Autocad, Matlab, ESRI, AVEVA, Cadence, IntelliCAD, MathCAD, Pro-Engineer, Solidworks, and Synopsys. 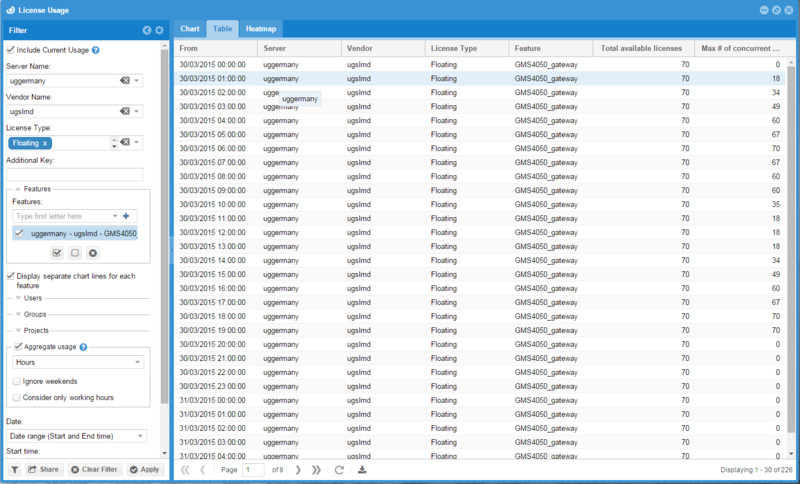 A click on the any of the users displays the users details as stored in OpenLM Users table. These tables can be synchronized with an organization’s LDAP database: e.g. : Microsoft Active Directory. The “Create new Project” window opens. Users can then create new projects and associate their working hours to these projects. For more information please refer to this document. 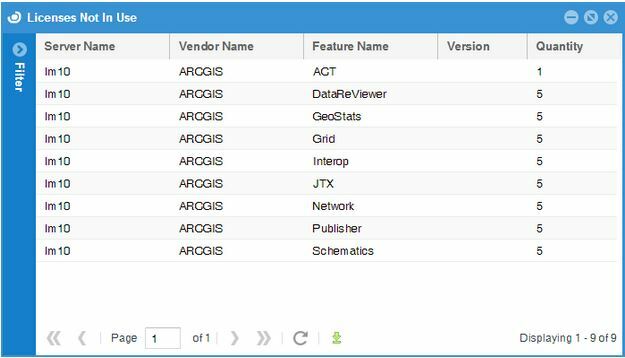 ArcGIS end users can set the licensing level before activating the software. If such a license is available, the software will start. 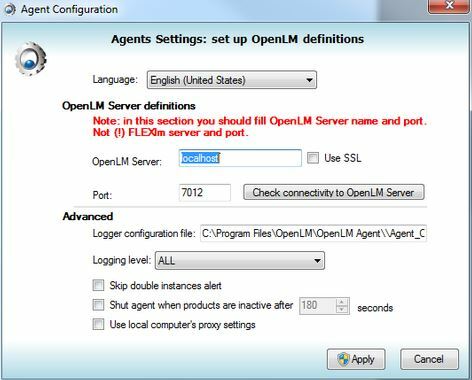 The OpenLM Agent Configuration form sets and tests the connection to an OpenLM server. Note – this is the OpenLM server, NOT a license (e.g. : Flexera FLEXnet) server. The Agent’s logging level may also be set here. A “Silent Install” option is available for automatic distribution of the OpenLM Agent to all workstations in the network. Idle licensed applications are identified. The Idle license condition may be utilized to invoke complex, conditional actions, e.g. : execution of a batch file script. Such a script will normally include license retrieval and application closure. Users can be alerted upon license retrieval. Users who have been awaiting a license will receive a license availability notification. 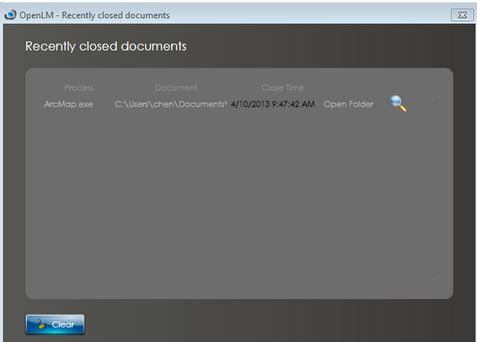 Click on one of the recently closed documents to reopen it.